JumiMouse is one of several tools provided in a complete package called the JumiOne app, the JumiMouse app allows you to completely control everything on your pc from your iphone; how freaking cool! Connecting and linking to your pc is pretty straight forward, a small program runs on your pc that waits for a connection (password protected) from your iphone. The phone scans your local network and connects to the computer you want to control. You slide your finger across the iphone screen to control the mouse pointer on your pc and everything is done in real time so its quite easy to get the hang of. You can use the JumiMouse to open up anything on your pc just as if you were sitting at the keyboard, talking of keyboard if you need to type something on your pc via the JumiMouse you just press the keyboard button and voila! you can now write direct from your iphone onto your pc. I often use the JumiMouse to access flash websites on my iphone because as you know, flash does not work on the iphone. In summary use this app to control your pc from anywhere. 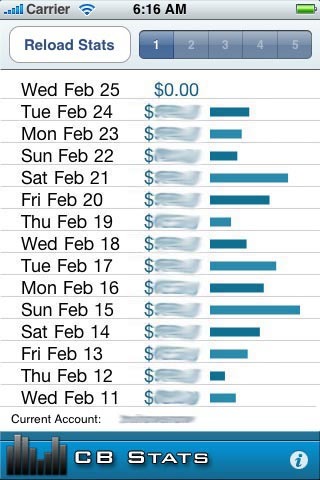 If your doing business online there’s a good chance your using PayPal to process at least some of your transactions. You can use this simple iphone app to keep tabs on your PayPal account via a simple secure login. 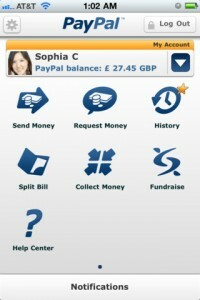 The PayPal app is free and saves time on logging into the main site but don’t expect all the features of the website. The dropbox is a special sharing folder you have on your computer/s just drag files into the dropbox and they are uploaded and snyc’d onto your other computers and now your iphone. Dropbox is a great way to move files around without having to email yourself or copy them to usb drives and memory cards. You can also use the drop box to share files, photos or whatever by providing people with a link direct to your dropbox but whilst keeping everything safe a secure at the same time. 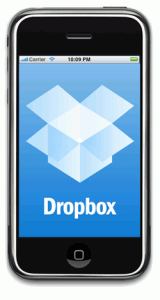 You can use the dropbox as a online back up of your important documents. And now you can get all these features for your iphone. Initially I had a few problems with this app, it would not recognize what I was saying. However they seem to have fixed this issue and this app is great for recording short notes or messages directly from voice into text. Open the app and hit the record button, press stop when you’re finished to see everything converted into text for use elsewhere. 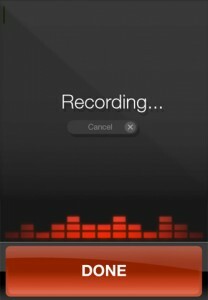 After recording you can quickly copy the text the clipboard, send a sms message, update facebook or twitter. This app is pretty neat, and work great for short messages. Thanks for reading. Rate, comment & subscribe below. place in any case as you’ll probably find the same apps there. I appreciate the information provided by you. This is interested to know about…. Thanks for sharing such great information. All of these tools are great and for marketing they are really fantastic. This is gonna be the best post on the web. All I want to say is, thanks for sharing it with us.